Exactly one week ago today I found myself with a box of plums. It was an unexpected surprise. A good surprise, but a surprise none the less. So I made jam. Easy as that, expect not easy at all because cooking with kids is fun minus all the really miserable parts that makes it hard. Baby Maria has a weird fascination with the window and it makes it so that I have to keep a constant eye on her. So I ergoed her. The Ergo is my baby carrier of choice for Baby Maria, the sling was my baby carrier of choice for Enzo. 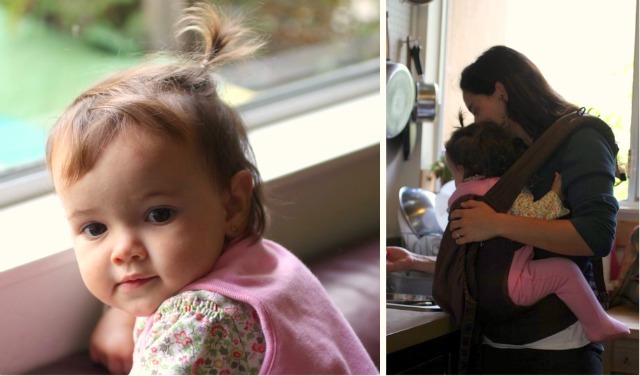 If you're a new mom who likes to cook I recommend finding a baby carrier that works well for you. You will use it a lot in the kitchen, make sure it's something you can throw in the wash along with your aprons and table cloth. My kitchen helper and I washed the plums together. Then I put her in the back so I could cut the plums otherwise her baby hands like to reach for the knife which is a a teeny bit scary. Then my kitchen helper bailed out on me and went down for a nap. When my baby sleeps I work. I grade papers, I read for my class, I blog, I do all those things that are impossible to do when she's awake. Cooking is hard to do when she's awake but it's not impossible. When she she woke up we finished the first batch. I made a recipe that didn't require pectin and it didn't work. Hello plum sauce! I had my friend Victoria come help me with the second batch. She brought fancy pectin, a pair of helping hands, and a great attitude. Plum Jam with Cinnamon was made with very little sugar. To find the full recipe please visit The Santa Cruz Sentinel, where I write a weekly food column and shared my plum jam recipe this week. Have you ever made jam before? 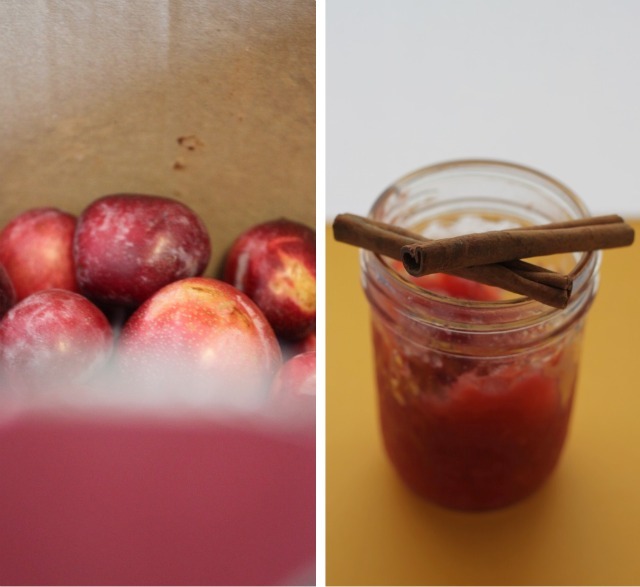 The first time I made jam was two summers ago when we rescued golden plums from the ground and made ridiculous amounts of golden plum jam. That summer we also made blackberry jam. Now we have jars of pretty red plum jam to enjoy, I think this is my new fave. post-edit: A reader sent me an e-mail that had some insightful information. I read your column every Wednesday in the Sentinel (my favorite section is the food section after the comics) and of course I found it delightful that your article focused on low sugar jam. I've been using Pomona's for years making these kinds of jam from all fruit including pears, and I love them. They're great and taste like the fruit they were made with! One thing I think is important to mention to your readers is that because of the low sugar, the jam colors will oxidize fast and look a bit cloudy. They don't keep as long in the pantry as higher-sugar jams ( I make so much every year so I have to be careful to check my "inventory" regularly for these signs of age.) Also, once opened, they also tend to go moldy quicker too, even if kept in the fridge, so small jars work best for these jams since the small jars are eaten quicker. I hope you continue to offer your fun insights on feeding our families!! Thank you! Thanks Jacqueline! This is really helpful. 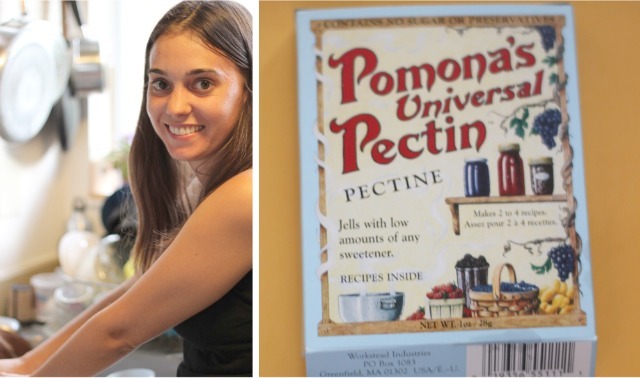 I am excited to use pomona's pectin again and pear jam...YUM! Funny that it didn't thicken. I never use pectin in my plum jam. Maybe it depends on the type of plums? I use the small oval shaped ones because we have access to a tree. I simply wash and halve the plums. Add a third the weight in sugar and stir. Put in the fridge overnight. (then all the juice comes out, and I have to try and stop myself from eating too much of that!) Then I put it on the stove until it goes thick. Easy peasy. I made peach jam for the first time this summer and it was delicious. I used a recipe that called for very little sugar (well, at least by jam standards) and no pectin. The jam only lasts about two weeks, but it was honestly gone long before that time. 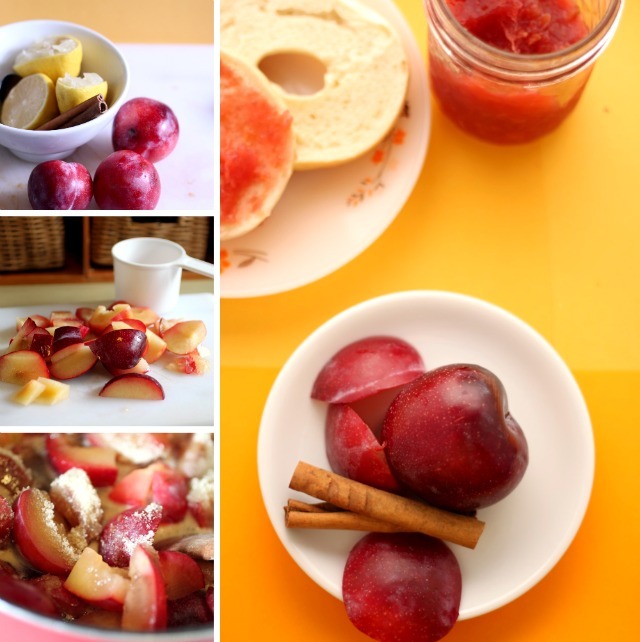 Your plum jam looks like fun. I'll have to check out what fruits are really ripe and in season at the farmer's market. Love the baby in the Ergo pic! If I'm baking, baby boy rides in an Ellaroo Mei Tai...maybe we're creating mini cooks with all the cooking exposure! Love your blog! Your family is so lovely! Thank you Christina what a wonderful thing to hear. My first jam attempt was peach, and for whatever reason, it didn't jell very well. It's more like chunky peach syrup, but it's still very yummy! The only jam I've made so far is strawberry rhubarb. I hope do a lot more next year when I have a garden. Come to think of it I don't thing I've ever even had plum jam. It sound like it would be really good though! my hubby would die for this jam...plums are his fave. and ERGO is MY FAVE! thanks for your comment on my blog because now i found yours! your site is gorgeous. am now off to browse. I love this time of year for the amount of jams you can make! I haven't made home made jams in awhile, but I know this year we will be. My grandchildren absolutely love jam and will be a good money saver making them from scratch. Plum jam here we come! The jam looks sensational. You're so luck to have plums! This looks so great. i can't believe how much you balance with two little ones plus cooking/writing/reading/grading! 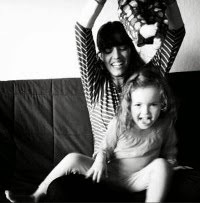 You are a super mom! Thanks Dana! I don't know how to stop. I should learn though.It gets overwhelming pretty quickly.